A fast month and a political light-year after Howard Dean stood poised to win the Iowa caucuses, the former Vermont governor took the stage at a rally Wednesday in Burlington and ended the campaign that once seemed unstoppable. How did the mighty fall? 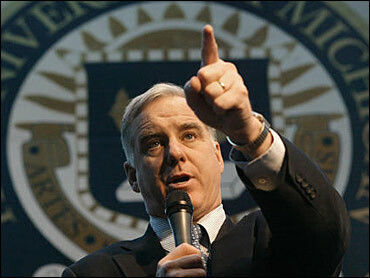 The answer is complicated and the rise and fall of Howard Dean will keep political coroners busy for years. Did Dean peak too early? Was he overconfident? Did former Vice President Al Gore's endorsement inspire Dean's opponents to play hardball? Did Internet financing fail to translate to voter turnout? Did Dean campaign on issues and forget to fight on character, too? Could he have used a little more political reticence and a little less directness? Perhaps. But then, would he be Howard? And would there be Deaniacs and Deaniebabies? Would there be thousands of young people (one-quarter of his contributors were under 30) running around in orange hats calling themselves Dean Storm Troopers? Would Senators Edwards and Kerry have opposed the $87 billion funding for the war in Iraq, or taken vehement antiwar stances? Would there be 800,000 people from half the counties in the United States giving Dean their own money, at an average of $77 each? "If Howard had been less direct, less blunt, less authentic, less true to himself and more cautious, he wouldn't have made some of the mistakes," former Dean campaign chairman Steven Grossman said. "On the other hand if he had been more cautious he might never have tapped into this energy and passion." And tap in he did. The week prior to the Iowa caucus, Dean's face brandished the covers of Time and Newsweek, an honor usually reserved for the winner of the New Hampshire primary. By mid-January, competitors trembled before his $40 million war chest and even Republicans were in awe of his groundbreaking fundraising apparatus. The former Democratic presidential nominee, Al Gore, had endorsed Dean; so had Gore's opponent Bill Bradley. And as Iowa approached, Dean got the endorsement of the state's most admired Democrat, Tom Harkin. Conventional wisdom in the Hawkeye State said that the Iowa senator was the kingmaker. But like all conventional wisdom this election year, Harkin's endorsement was worth little. No one can crown a king the people don't want and, in then end, they just didn't want Dean. The week after Dean placed third in Iowa, he placed second in New Hampshire, a state he once looked sure to win, a state that borders his own. Two years and $40 million later, the Dean campaign had nothing to show for it. They were nearly broke. All advertising was suspended. An additional $10 million earned since the New Year did not help. Dean shook up his campaign, demoting his dedicated campaign manager Joe Trippi, the pioneer of Dean's Internet fundraising phenomenon. "I think the campaign revolutionized American politics," Trippi said. "I mean there is no one that can change the fact that by using the Internet to create a grassroots network across the country, we raised more money in small donors than any Democratic campaign in history." No one contests that fact. Dean did revolutionize political fundraising. He democratized what had become the stuff of banquets and $1,000 tables. The Park Avenue-born Dean attempted to become a great populist, capitalizing on his insight into fevering Democratic voters and their anger over the war in Iraq. But even at his peak in late December, after the Gore endorsement, polls still showed Dean losing to President Bush in a general election. That was at the height of Dean's popularity and before the Bush campaign had spent a dollar of their monumental campaign coffer. Democrats became pragmatists. They went with the man strongest in the area where Republicans have always prevailed – national security. Sen. John Kerry's decorated Vietnam service, as well as his presidential demeanor, won him contest after contest. At his resignation speech Wednesday, Dean said he would not run as a third-party candidate. He urged his supporters to unite behind whomever the Democrats choose to oppose Mr. Bush. "We have demonstrated to other Democrats that it is a far better strategy to stand up against the right-wing agenda of George W. Bush than to cooperate with it," Dean said, to a surprisingly optimistic yet heart wrenched crowd of supporters. "I am no longer actively pursuing the presidency; we will however continue to build a new organization using our enormous grassroots effort." This organization will attempt to bring progressive delegates to the Democratic convention. Whatever form it takes, it will be very much a la Dean. He was fond of quoting the mantra of the late and iconoclastically liberal Sen. Paul Wellstone of Minnesota. "I represent the Democratic wing of the Democratic party," Dean often said. His organization will, too. "This is just the tip of the iceberg," Trippi said. "It is going to continue to grow and change the country in the same way that the Kennedy/Nixon debate was a harbinger of what television was going to do to change politics. I think the Dean campaign did that with the Internet." Dean was the only candidate whose supporters referred to by his first name. He won support by denouncing political speak and instead, spoke his mind. But his nature was the bane of his success. He began to appear unpresidential. The forthright attitude precipitated unforced errors, the dreaded gaffes – and there were many of them. There was the frenzied "I Have a Scream" speech after his loss in Iowa. He said America wasn't safer after the capture of Saddam Hussein. He admonished a Bush supporter, yelling at him to sit down. He said that he wanted to be the candidate "for guys with Confederate flags in their pickup trucks." His off-the-cuff opinions needed to be re-expressed, such as his dissing of the centrist politics of Democratic Don Bill Clinton, the former president. "If he had been more cautious, he wouldn't be the human being he is. But I guess one of the lessons learned is that when a campaign grows as rapidly as the Dean campaign grows the momentum can outstrip the infrastructure you put in place," said Grossman, who left the campaign Monday and caused a last minute deflation of Dean's already deeply waning effort in Wisconsin. "But you never could have anticipated all that happened. We've never seen anything like this," Grossman continued. "He was a fresh face that energized millions of grassroots activists, giving them a sense that participatory politics matter and political fundraising will never be the same."